Win from Within: Finding Yourself by Facing Yourself | Your #1 Source for Kindle eBooks from the Amazon Kindle Store! Mega-Pastor and media personality John Gray uses powerful Biblical principles to help you become your best self — the person God created you to be. 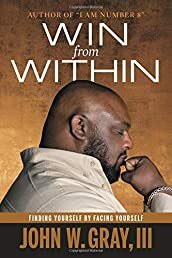 In WIN FROM WITHIN, John Gray helps readers identify how best to handle the most difficult, challenging and yet necessary battle that we all face-our inner struggle to overcome the worst versions of ourselves. He offers biblical lessons to aid in combatting bad habits and limiting patterns so that the best version of ourselves emerges. WIN FROM WITHIN gives practical application to the story recorded in Genesis of Jacob wrestling with the man at the River Jabbok, and through it readers will learn how to become the persons they were created to be. The persons God intended each of us to be develops as we face our inner battles. With examples from his own life as well as his ministerial counseling, Gray provides a pathway to awakening. He includes strategies for confronting the past, how we have been labeled, who people have said we are, even who we think we are, so that we can win the battle and be who God intends us to be. Jacob spent much of his life running and hiding from himself. At a certain point we, like Jacob, cannot run from our true selves anymore. We must stop and face ourselves if we are to become great. WIN FROM WITHIN helps us conquer our inner darkness and overcome such hindrances as fear, shame and guilt. This powerfully biblical self-help guide will push us toward victory over our inner struggles. Winning will make us the persons we have always wanted to be, the persons we have dreamed about becoming, the persons God created us to be.